I've had more couples requesting gluten-free, wheat-free, lactose-free, or other special-free something wedding cakes. Hawaiian Style Weddings offers full service destination wedding planning for romantic, stress-free weddings on Maui, Oahu, Kauai and on the Big Island of Hawaii. Reception planning includes post-wedding coordination to provide the custom wedding cake. This summer, more families are requesting their cake be unique in more ways than the decorations. Some couples or family members have allergies and food sensitivities, and traditional wedding cakes present a dramatic problem as they include wheat, dairy, and other ingredients that must be avoided. Gluten-free means that all foods are free of the wheat protein called gluten. For over 15 years, owner/baker Marie Cassel and staff of Sweet Marie's Hawaii Inc. Restaurant & Bakery on Kauai has operated a dedicated gluten-free kitchen with a bakery and restaurant. Cassel was the first baker in Hawaii to offer gluten-free wedding cakes. "When a couple consults with me on planning their gluten free wedding, I make a list of all their allergies and food sensitivities. Oils used in baking could include barley so I use only the finest organic ingredients. For wedding cakes, I use organic palm shortening for a creamy, delicious dairy-free butter cream icing." Cassel offers wedding couples personalized tastings and samplings at her downtown Lihue bakery. Hawaiian Style Weddings produces weddings across Hawaii. Rothenberg continues, "I have to have reliable resources on all islands to insure my wedding couples can feel safe and healthy on their honeymoons. 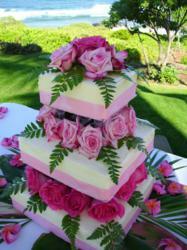 On Maui, I rely on Marie Audant at Ghiselani Designer Wedding Cakes. Audant's creative designs are not only exotically beautiful, she is attentive that my clients' orders are made per their unique dietary requests." In July, Audant was hired to create a custom-designed wedding cake for Hawaiian Style Weddings’ clients Phyliss and Dan Pruden. "Our best man," bride Phyliss said, "is gluten sensitive and we asked Marie if she could make a smaller cake to match our larger one for our reception dinner. She made a special gluten-free cake and helped me pick out the flavors." Audant often substitutes freshly made organic juices for water and milk. Audant added, in her romantic French accent, "For flavorings, I offer over 50 organic pure essences that include a variety of spices, gingers and more. We listen and cater to all dietary concerns using only the best ingredients and flour substitutes of potato starch and rice flour with baking soda." Mark Steffan, owner of full service wedding planners Maui'd Forever agrees, "We want to accommodate everyone's special dietary requests so that their wedding experience is the most romantic and, above all, stress free. " Rothenberg concluded, "I tell my wedding couples that the pre-wedding planning is so that they just show up at their wedding knowing that the details have been handled. Their special-diet wedding cake is just one of the details that we are happy, with our talented, conscientious bakers, to provide."